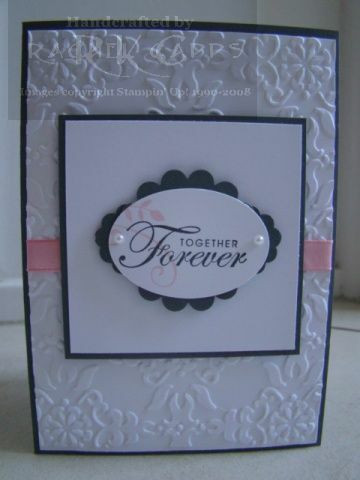 So the next leg of my sister’s wedding invitation journey was to add a touch of pink. 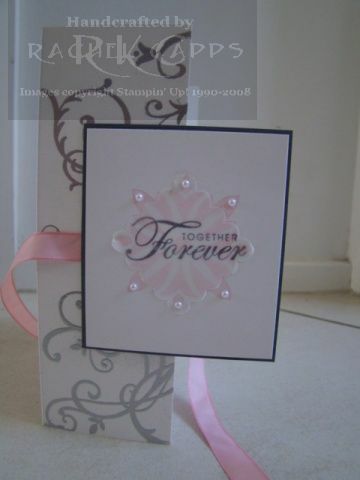 I used the basis of the last invitation – the Baroque Motifs card opening in the middle, and I firstly changed the ribbon to Pretty in Pink taffeta ribbon. 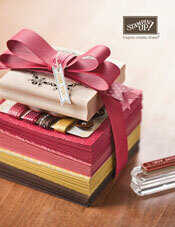 And I also used Stampin’ Up!’s gorgeous shimmer paper. 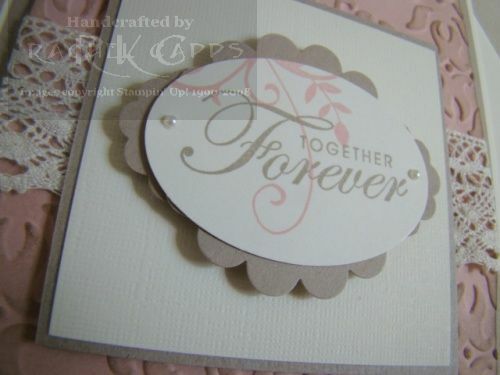 Next I stamped the square image from Baroque Motifs in Pretty in Pink and then layered it with vellum stamped with “Together Forever” from Together Forever (retired) in Basic Grey. And I added lots more pearls! 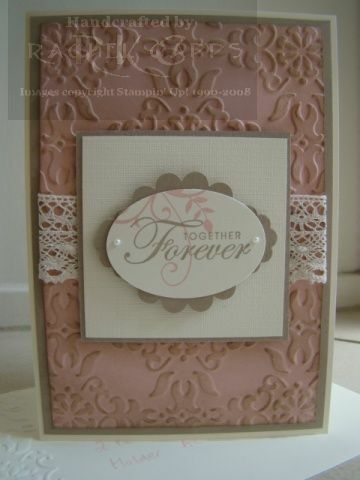 Tomorrow I have another mock wedding invitation with even more pink! 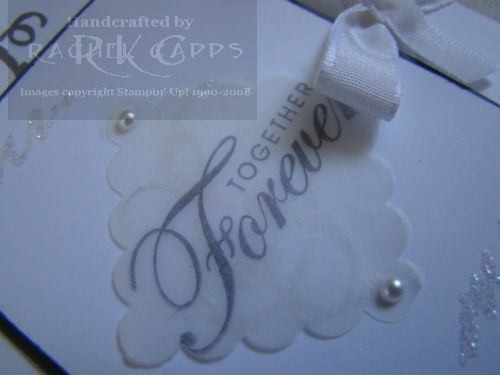 The next mock invitation I made introduced the “Together Forever” stamp from the stamp set Together Forever (retired). 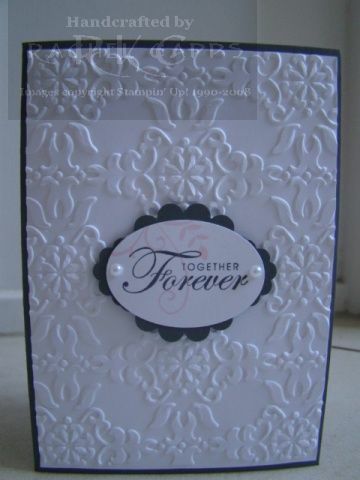 And we ended up with a winner there – as “Together Forever” is used on the final wedding invitation. 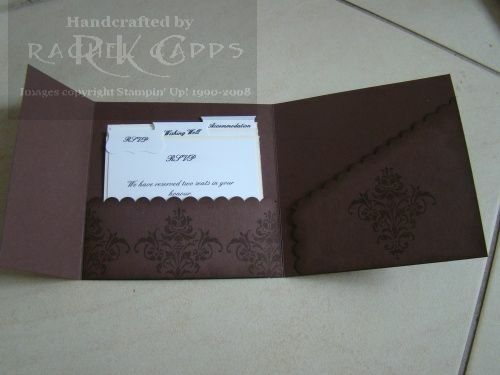 We also tried a different way of opening the card – this one opened in the middle. 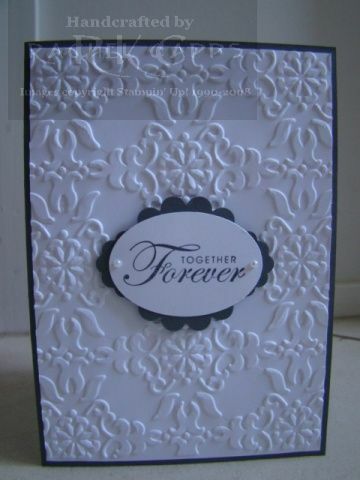 I stamped the Baroque Motifs in versamark random over the Whisper White cardstock and then I embossed it with silver embossing powder. 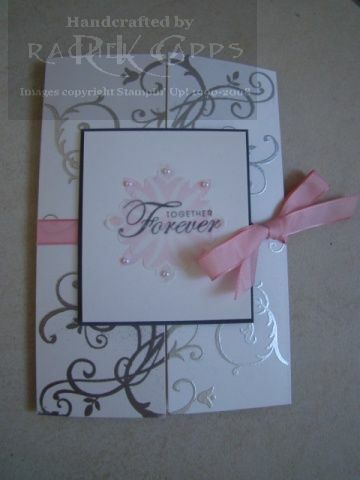 For this card, I also added a subtle “Mr and Mrs” on the front panel which was stamped in versamark, then heated with Heat & Stick powder, and then heated again with Dazzling Diamonds. 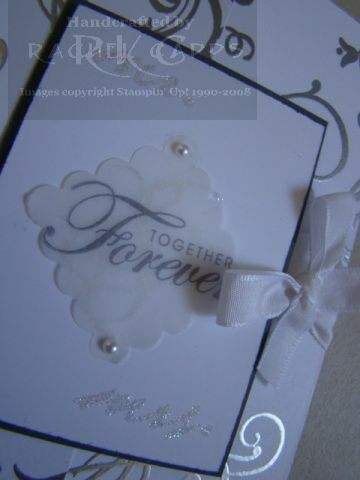 I punched the scallop square out of vellum and layered it over a very subtle “&” from Together Forever. 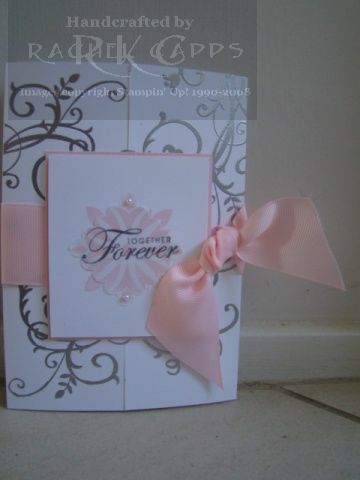 Two pearls added a touch of class and a white taffeta ribbon and bow tied it all together. 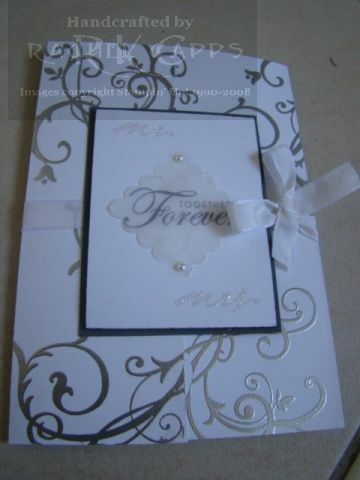 So the next step on the journey to find the perfect wedding invitation was to introduce En Francais. And I turned to the colours of Basic Grey and Whisper White. 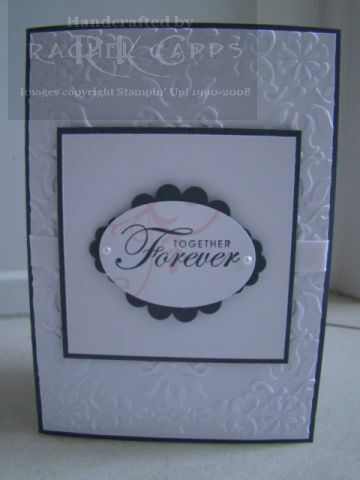 Now, Cath had told me she liked this card. 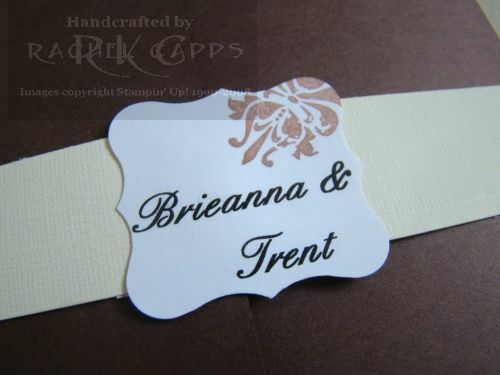 So I mocked up something similar in her colours, but a little less busy. 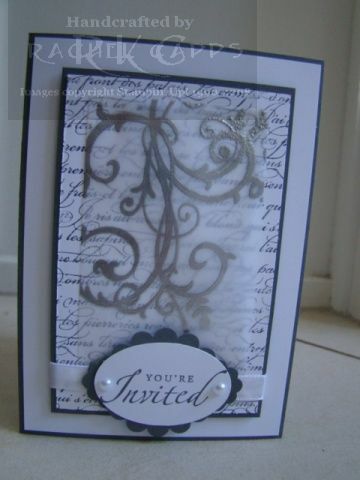 I stamped the Baroque Motifs flourish in versamark on vellum paper and then embossed it with silver embossing powder – now that is tricky! 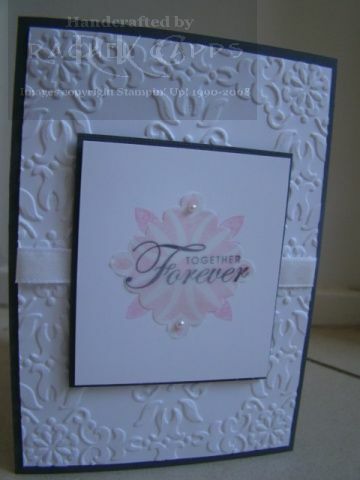 The embossing powder melts lovely, but the vellum paper isn’t a fan of too much heat! 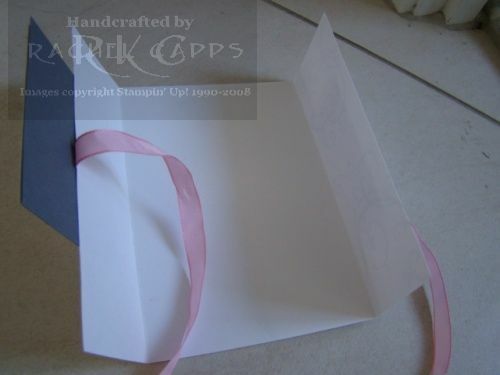 I then layered the vellum over a stamped background of En Francais. 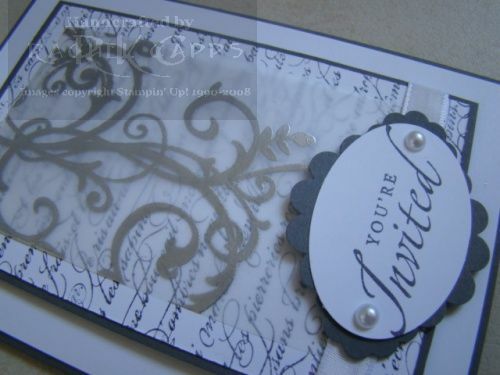 For the “You’re Invited” stamped in Basic Grey from Sincere Saluations, I decided to try a different combination of punches for the layering of the Basic Grey cardstock. 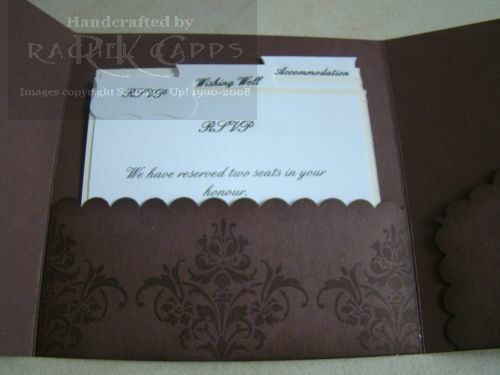 I used the scallop circle punch and two scallop oval punches. 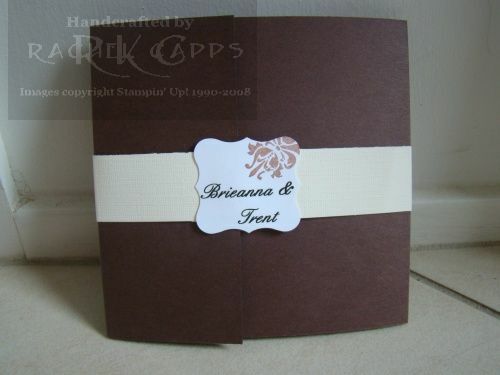 This was a winner, as the way I layered the punches is used on the final wedding invitation – although not with this sentiment. 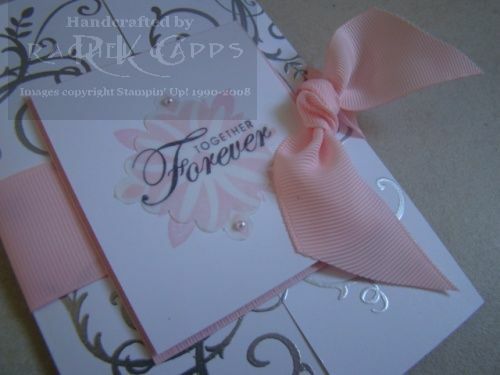 Then I added a touch of white tafetta ribbon and some pearls.